Stephanie Lendrum is the owner and artist behind Phylogeny Art, a line of detailed painted notecards inspired by nature. She’s joining us today to give you her top holiday craft fair selling tips for seeing success at holiday markets and other events and fairs. Stephanie’s holiday market presence has continued to grow steadily for the 4 years that she’s been doing shows. She learned a thing or two (or 12) from that first year and she’s continued to develop a presence that brings new and returning customers in on a regular basis. In fact, she’s proud to be able to say that she’s turned a profit in every show she’s done, with a turnaround of at least 3x over the entry fee, and upwards of 6x at a show a few weeks ago where other vendors were barely able to cover their table fee and struggled to sell merchandise above $5 price points. The holiday market season is here. Along with it comes excitement, chaos, and exhaustion – and hopefully profits too. Bottom line – I think the key to success is to learn from your experiences and build your presence from one year to the next. I was invited here to share with you some tips that I’ve learned from doing holiday markets over the past 4 years. What you’ll learn from this post: I wouldn’t exactly call this my “recipe for success.” It’s more like a lesson in evolution. I hope that what I’m sharing here will help bring success to your booth this holiday season and in years to come. What I’m not going to cover: There are loads of articles about how to design your display, and what to bring with you. Don’t get me wrong, those are important pieces of information! But I think that the techniques I’ll share here will be enlightening and fresh. 1. Treat your visitors like birds in your garden. Invite them in. Welcome them warmly with a nice hello and a genuine smile. But then… leave them alone to wander and discover. Let them pick things up, and interact with your items. If it looks like a visitor is having a hard time deciding, strike up a casual conversation about your items. But keep in mind: there’s a delicate balance between being pushy/salesman-y and being helpful. Your approach can be the difference between turning a visitor into a loyal customer, or one who will fly off to another less pushy vendor. Bonus tip: Incorporate some disarray in your display on purpose. I scatter some card packs around on my table. Yes, it looks disheveled. But if your display is too perfect, your visitors will actually be less likely to interact with your items! Why? Fear that they’ll disrupt your perfect display. 3. Bring your thinking caps too. After I say my warm hello and go back to making tags… I listen. What are my visitors saying? It’s usually something quiet, and under their breath. Do they “love” what they’re holding? Do they pipe up and ask if I have something in particular (my most recent: “Do you have anything with owls?”). Those are important things to consider for the next year – take a mental note of each comment and suggestion. Those ideas are what should drive your work for the next year. And the busy-work also gives an opportunity to brainstorm and build on those suggestions. 4. Variety is key. Take the garden theme. If a garden is full of roses, it will attract visitors that love roses. And that’s about it. Now, consider your market booth. If you only sell one thing – even if that thing comes in a variety of styles – you’ll only bring in visitors who are looking for that one thing. And you probably won’t be bringing in many gift buyers either. They’re generally browsing for the “right thing,” so they tend to shop at booths with a variety of ideas. My approach to this – I try to add something completely different to my line every year. They haven’t always panned out to best-sellers, but the variety helps bring new visitors in to take a closer look. And I continue to attract my loyal customers who are eager to see the new ideas I’ve come up with. 6. Be your brand. If you’ve already worked on branding your small biz or your website, then this isn’t news to you. But it’s beyond important to brand your market booth. Why? It makes you look more professional – and it helps you to stand out as your own space in the marketplace. But your branding goes far beyond your business cards. Think about your display. Do the containers you’re using match the aesthetic of your brand? What about your tablecloths? Do you have a banner? And consider that you’re on display as much as your handmade items. Have you thought out how you’re dressed and if you match your brand image? 8. Get a card reader. I’ve heard a lot of people ask if they need one. Yes. In this day and age, you should have one. And if you have a smart phone or a tablet with internet access, you have no excuse not to have one. True, many customers will bring cash with them. But if they run out of cash at the show before they get to your booth, do you really want to say “No, I can’t take your card, I only take cash?” No, definitely not. So how do you get one? If there’s still time before your show, you can request many of them online and they will be shipped to you for free. Or just go to your local office supply store and buy one (they’re usually around $15, and well worth it). How do you use them? They’re super easy! If you’ve ever swiped your own card at a grocery store, you can swipe a customer’s card. And each reader has an app to download with instructions on the app and online. Just be sure to practice with the app a bit before the show so you know how to operate it, and you’re good to go. 9. Evolve. After every show, I take notes about the show. What did I learn, what did I overhear, and what were my customers asking for? In my last show, customers asked me about owls and finches. So for my show next week, I’m making some owl and finch ornaments. They aren’t custom orders. Just something those customers were interested in – interested enough to speak up. I think that #9 is really the main key to success. Whatever you learn at one show can be applied to the next. Don’t get me wrong, I understand the desire to stick to your guns, especially as a creative. But to make the items you want to make, you need to be prepared to offer your customers what they want to buy. Evolving, and rolling with the punches from one show to the next allows your booth to improve. And you never know where those changes will take you! You may find a new way to display your items that makes people more likely to grab them and then buy them. Or that one trinket you made might end up being incredibly popular… so much so that you may spin off a whole other line for your business. But that’s only possible if your mind is open to evolving and spinning along with it. So that’s it. My suggestions for market success. Like I said at the beginning, it’s not a “recipe for success.” I can’t tell you exactly what to do to guarantee that you’ll make a profit. But I can tell you that from my experiences – and from learning to evolve – each market has been more successful than the last. It’s one big learning process. I hope that my techniques give you a different perspective as you prepare yourself for this holiday market season! Learn how to create a craft show application that avoids pitfalls and prepares you for success. Awesome! 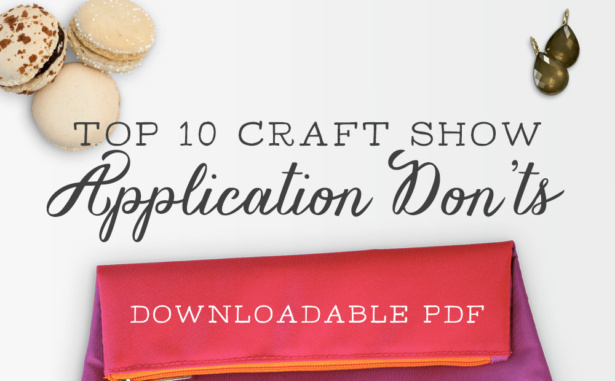 Your Craft Show Application Don'ts list is on its way to your inbox. Great tips! I started incorporating more signs and found it very effective! I have also made a breakthrough in terms of interacting with customers. I love the birds in a garden metaphor. So true! Having a variety of items is so true. Thanks for sharing! Thanks for taking the time to comment, Cathy! I’m glad the post resonated with you. That was terrific advice. I haven’t done craft shows in about 25 years, but am excited to re-enter that arena with my new art business as an ‘older/wiser’ artist! Thank you Stephanie and Arianne. I’m so glad to hear it was helpful, Patti!